The Windows Vista file explorer introduces interesting and user friendly filtering & sorting capabilities via column headers. By using TAdvStringGrid and TAdvStickyPopupMenu (available in the TMS Component Pack) it is possible to add a similar interface to your applications. To achieve this, set grid.Look = glVista. This will change the fixed cell colors to appear with mirrored gradients as well as hover & down colors. To have a dropdown button on fixed cells, set grid.ControlLook.FixedDropDownButton to true. Hovering on fixed cells is enabled by setting grid.HoverFixedCells to hfFixedRows. Drop a TAdvStickyPopupMenu on the form. The menu items are set to allow to configure a filter for values 0..25, 26..50, 51..75 and 76..100. 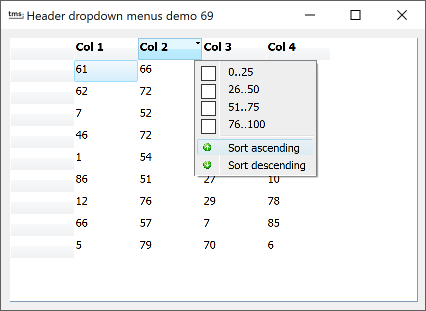 Two items are added to invoke ascending or descending sorting.